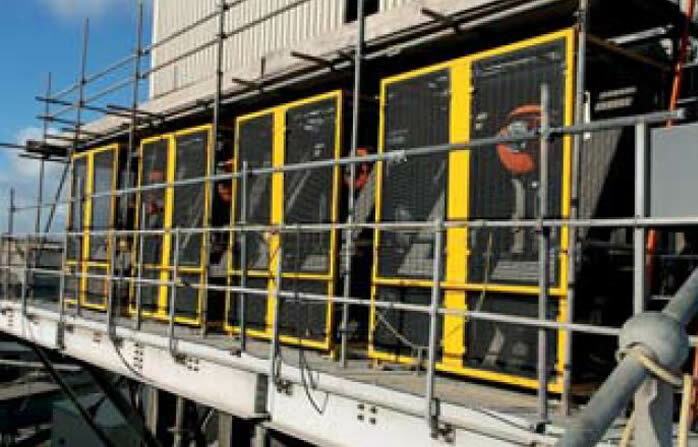 Prevent buildup on container walls and obstructions at unloading ports using controlled bursts of air. Keep material flowing efficiently from start to finish! At Martin Engineering, we are dedicated to helping you boost profits by keeping your product flowing with as little unscheduled downtime as possible. 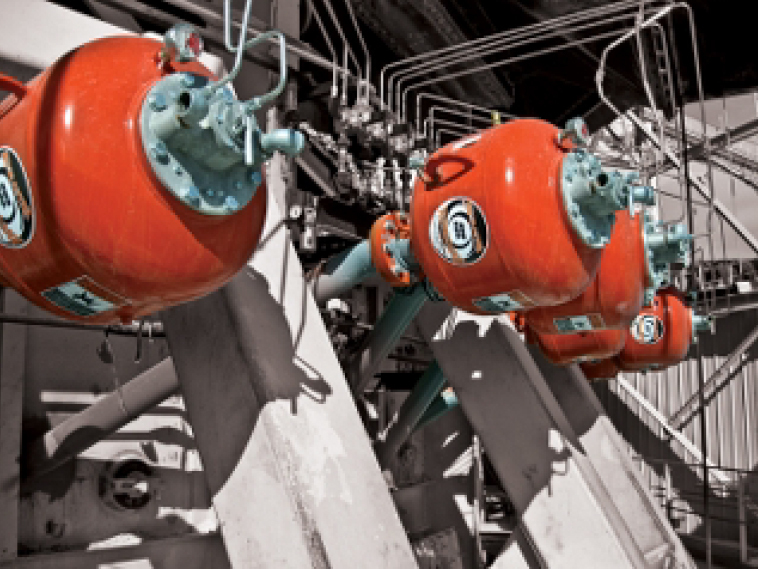 Our air cannons release timed bursts of compressed air that break up accumulations and bottlenecks in process vessels without damaging your equipment. We also offer innovative nozzles that can be removed easily from the outside for cleaning or replacement without having to remove the entire air cannon, as well as high-quality valve assemblies and electronic controls. 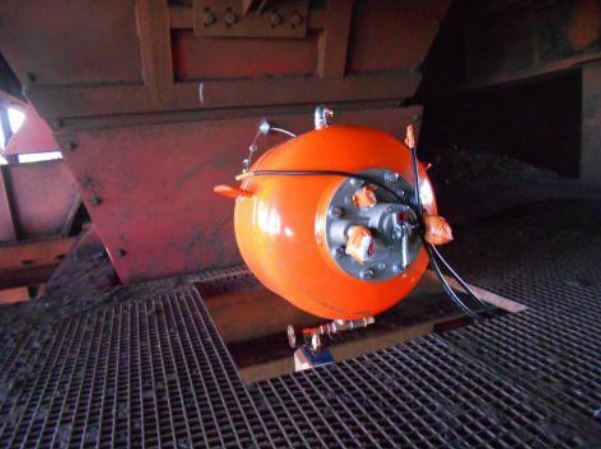 In addition to air cannons, we are a global leader in manufacturing industrial vibrators, which are effective in a wide range of applications, especially involving bulk materials with small particle sizes or situations where the equipment can’t be permanently installed, such as a dump truck bed. More profits - Keeping material flowing at top efficiency and maximum throughput means more revenues and more profits. Improved efficiency - Eliminating obstructions and buildup substantially improves throughput without adding significant labor or energy costs. Safer work conditions - Workers no longer have to climb inside containers or under unloading ports to break up blockages manually. Less wear and tear on equipment - Cleaning and unblocking bulk materials manually requires tools that damage equipment over time, while air cannons use harmless bursts of air. Reduced downtime - Because the air cannon fires at timed intervals, material doesn’t have a chance to build up in the first place, so there’s no need to shut down to remove obstructions. 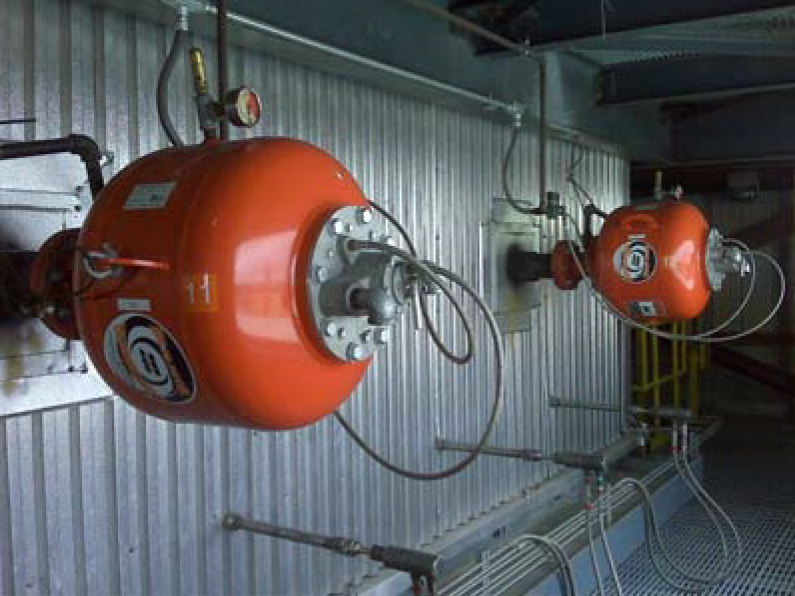 Improve flow in silos and storage vessels using bursts of compressed air. 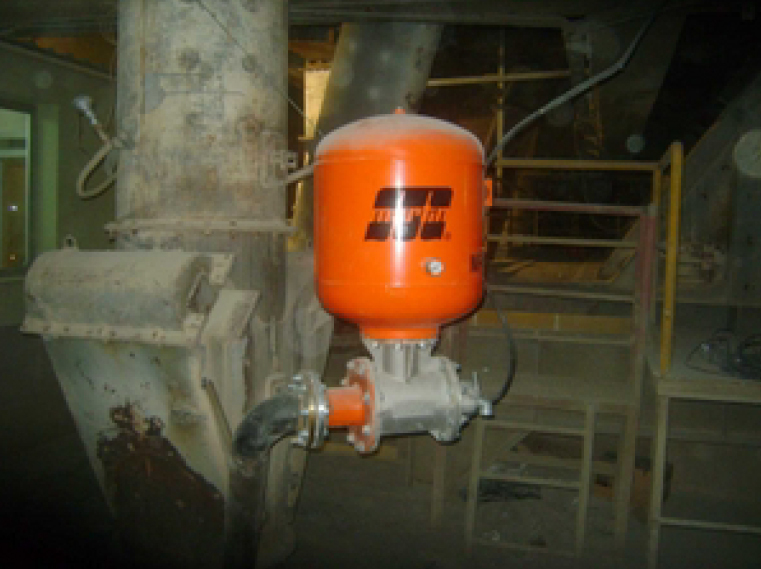 Easily replace nozzles without removing air cannons and stop damaging your refractory in the process. 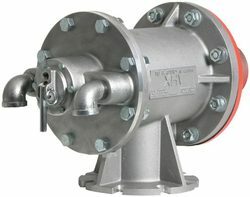 Including valves, nozzles, controllers and safety shields for flow aid products. Let us help you solve yours as well. All products and services provided by Martin Engineering carry our Absolutely No Excuses Guarantee. If we don't solve your problem, we will fully refund your money or provide a different solution for you. Period. At CEMEX in Tennessee, buildup on the walls of the pre-heater was a continuing headache for operating personnel and a consistent production bottleneck. 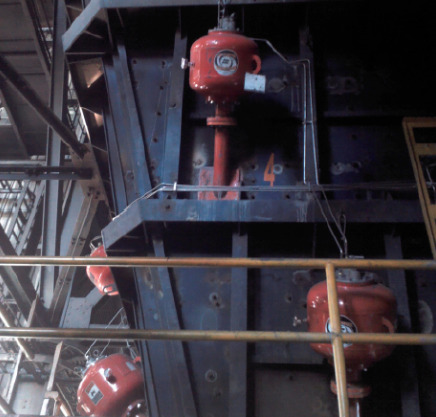 To knock down the buildup, the plant resorted to water blasting, but the frequent water blasting proved costly, with high labor expenses, shortened refractory life and reduced kiln efficiency. During the power plant’s summer outage, an independent contractor designed and installed new chutes to feed the coal mills. But at start-up, material clogged in these new chutes and closed off the flow of coal into the boilers, causing the plant to shut down. The plant needed an emergency-response “quick fix” to return to production and a solution for long-term correction. 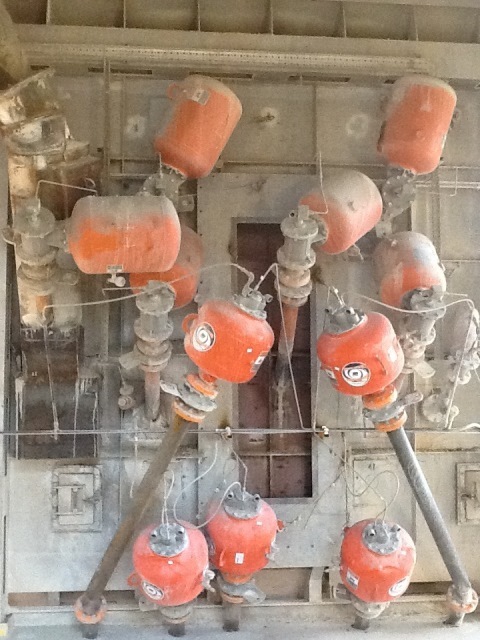 A plant used water blasting to remove material buildups from the pre-heater tower’s riser duct. Personnel were required to open access doors into the tower twice a day to remove the accumulations with a high-pressure water spray. The water blasting caused production problems, dropping lumps into the kiln feed, downgrading kiln efficiency and clinker quality. To keep up with the steel mill’s around the clock, seven days-per-week schedule, the railcar dump must provide 3,000 tons of coal per day, every day. But the operation was at the mercy of the handling properties of the coal. Coal with higher moisture content, material density or size ranges would hang up on the walls of the receiving bin below the car dumper. Material would build up at the inlet to the pre-heater tower. These accumulations choked the flow of material, reducing the plant’s production from its design rate of 3,000 to 2,700 tons per day. To regain capacity, the plant would take unscheduled outages to allow manual cleaning of the ducts. After cleaning, the buildup would resume, with flow choked again within ten days. Fine sugar used in a line of powdered drink mixes would build up on the walls of the storage silo. This choked the flow of sugar out of the silo leading to slowdowns in production. By the time of the annual outage, there would be between 40,000 to 60,000 pounds of sugar stuck to the vessel walls. The cost to recover and reprocess this sugar was a considerable drain on the budget. This plant is a new, state-of-the-art facility, but designed without air cannons on the pre-heater tower. Consequently, material flow through the pre-heater was subject to blockages, requiring excessive (and potentially risky) labor. Martin installed air cannons, set to fire in a sequence starting from the kiln feed shelf and working up, alternating side to side, until all the cannons have fired and then starts over. To preserve the life of the air cannon’s piston and sealing o-rings, oil was added to the air supply. But as the air cannons would discharge the oil would collect on the filter, causing the filter to plug or bind. Filter efficiency would go down, which in turn reduced plant output and increased maintenance problems. 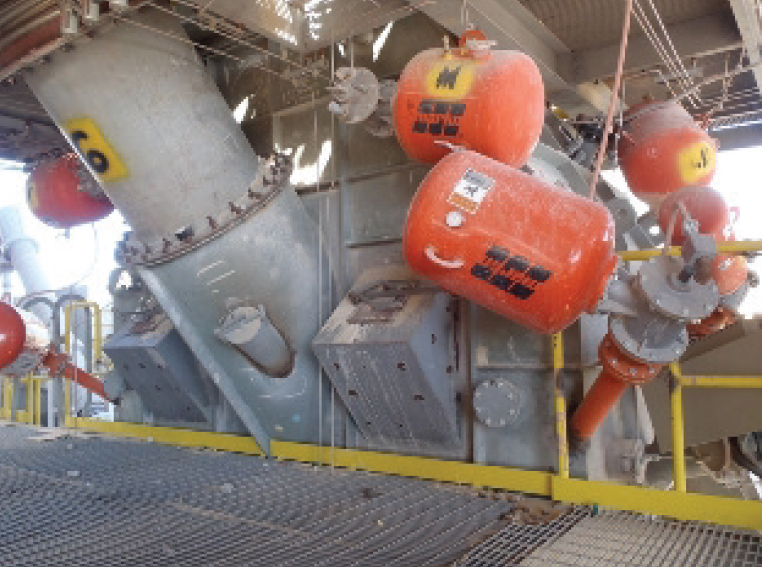 The plant installed Martin® XHV Retrofit Valves on the air cannons. Before wood shavings can be pressed into particleboard, they are dried in a chips dryer. The plant uses a flat line, ten-zone oven. Screens form the sides of the oven to keep the chips away from the coils that heat the oven. Sawdust picked up by the oven’s circulating air would stick to the screens, clogging the openings and reducing air movement. A power plant uses petroleum coke - a refinery waste product - to fire its boilers. But the sticky material would build up on the walls of the chutes carrying it from the gravimetric feeders to the boiler. Instead of the 300 tph required, the feed rate would slow down to 75 to 100 tph, starving the boilers. The plant staff resorted to frequent cleaning of the chutes. A cement plant in Florida was producing 2,500 tons per day of clinker. Air cannons were not included in the design of this new plant. 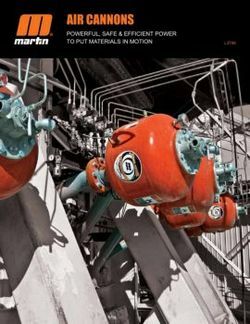 Martin Engineering developed a plan for the installation of 45 Martin® Air Cannons on the new pre-heater. Crews from MartinPLUS® Services group installed the pre-heater air cannon system. This fuel-efficient kiln operates by alternating the firing of two shafts, so one shaft burns while the other acts as a fuel for exhaust gases. The heated gases leave the combustion chamber through arches opening into a crossover channel. Dust would adhere to the refractory in the arches, choking the flow of gases from one combustion chamber into the other. A cement plant in Matozinhos, Brazil is one of Brazil’s leading cement production facilities. Opened in 1959, the plant produces 660,000 (600,000 metric tons) tons of clinker per year. The need to improve efficiency and maintain production without outages led company officials to consider ways to improve flow through the plant’s pre-heater tower. At this rail-to-barge trans-loading facility, a set of six stacker tubes connected by conveyors allows the stockpiling of coal. Coal would hang up inside the tubes, sticking to the walls, building up inside. To clean coal out of the tubes, the operation used manual labor. A man-lift would be used to raise personnel to the lowest window of a stacker tube, so they could dig out the accumulated coal. A cement plant produces 1,100,000 metric tons per year of clinker from one line. However, air cannon systems supplied by competitors were not working properly, leaving material buildups in the preheater tower. The buildups required manual cleaning at least two hours every shift, and a monthly slowdown for a major cleaning. 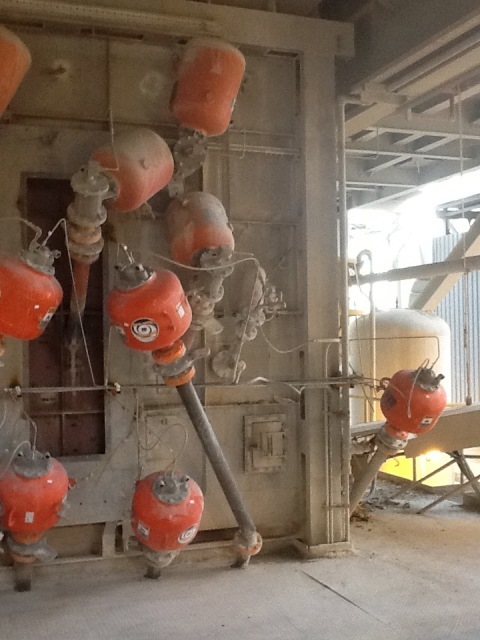 A cement plant was battling buildup problems in the cyclone discharge pipe following meal pipe expulsion. The buildup of sticky material created blockages leading to a smaller output opening at the bottom of the cyclone discharge pipe, causing serious production loss. 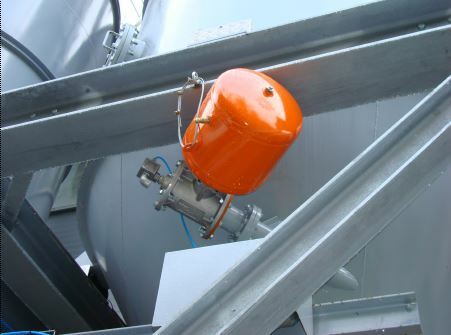 To prevent blockages in the Cyclone discharge pipe, Martin Engineering determined suitable places for air nozzles, and installed two Martin® Multi Port Air Cannons. Koda Energy was battling significant buildup problems. Efficient material flow is a critical element of biomass-fired boilers, and accumulation or blockages can take a big bite out of a plant’s efficiency. 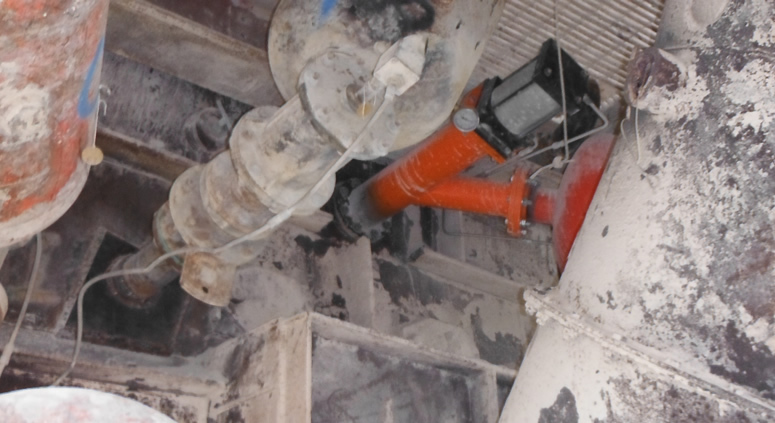 Ash buildup on furnace walls and tubes can choke the process, degrading equipment performance and introducing the potential for safety risks during clean out. A cement facility includes a state-of-the-art, six-stage precalciner/preheater with a rated capacity of 660,000 tons of clinker per year. Efficient material flow is a key component of Drake's dry-process manufacturing, and accumulation in storage bins, process vessels or feed pipes could choke even this well designed system. The facility's system required some fine tuning. Votorantim Cimentos is one of the world’s leading manufacturers of cement, concrete and aggregates building two new plants as part of a massive $2 billion investment to enhance production throughout Brazil. These new plants are expected to produce approximately 8,500 tons of clinker per day between them. Starting in the early design stages of the project, Votorantim has maintained an intense focus on efficient material flow. 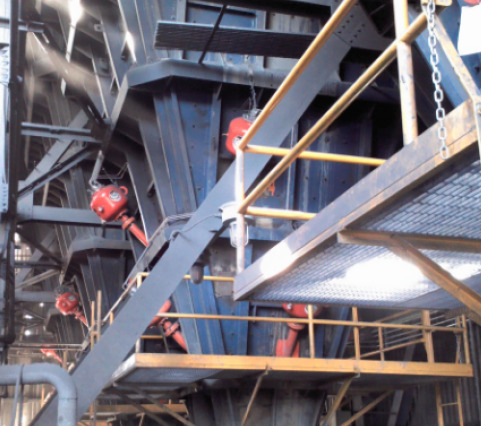 Izmir Cimentas manufactures 5,550 tons per day of clinker from two production lines. They had an under-performing existing system, which was jeopardizing the plant’s output capacity by failing to remove accumulated material from the preheaters. The build-up issue needed manual removal on a daily basis, which required at least two hours’ maintenance each time. 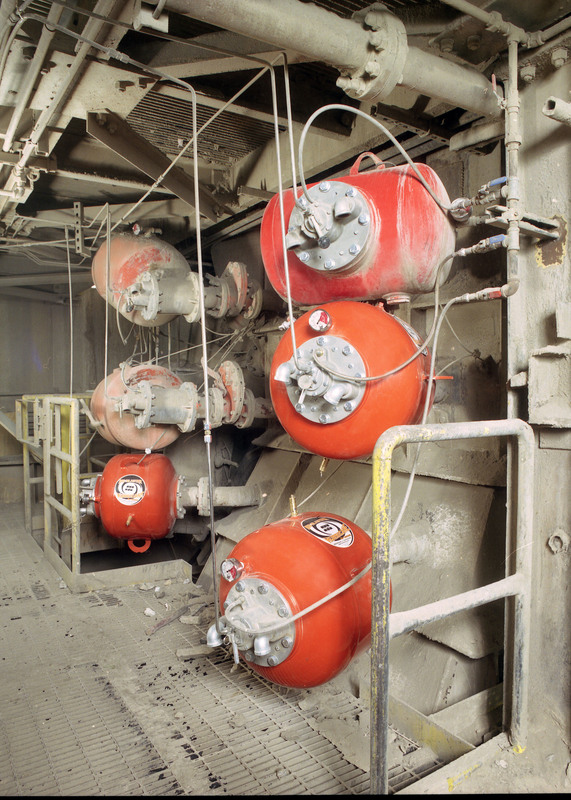 Over time, operations personnel noticed a drop in SCR performance, and during a scheduled plant outage they inspected the system and discovered that fly ash contained in the exhaust stream was accumulating in the top layer. To address the situation, the plant was forced to enlist a contractor to come on-site 2-3 times each year during scheduled plant outages and evacuate the build-up. Soon after the plant went online, and the high-volume ramped up, engineers started noticing bottlenecks. They noticed a slowdown due to a material build-up in the chute feeding the export silo and discard bin. Operators determined that the freshly-pressed cakes were sticking to the walls of the chute, narrowing the space for product transfer and leaving “rat holes” which restricted flow. The Büyükçekmece cement plant located west of Istanbul, Turkey had to manually dislodge material buildup in one of their cyclones in order to maintain throughput. The unscheduled shutdowns to allow cleanout of the cyclone of the cone and deep tube interfered with production schedules and exposed maintenance staff to potential hazards. Rainy weather was causing buildup problems at a steel production plant. The material was accumulating on the walls of the hoppers causing a consistent production bottleneck. To knock down the buildup, the plant resorted to hitting the walls with tools. 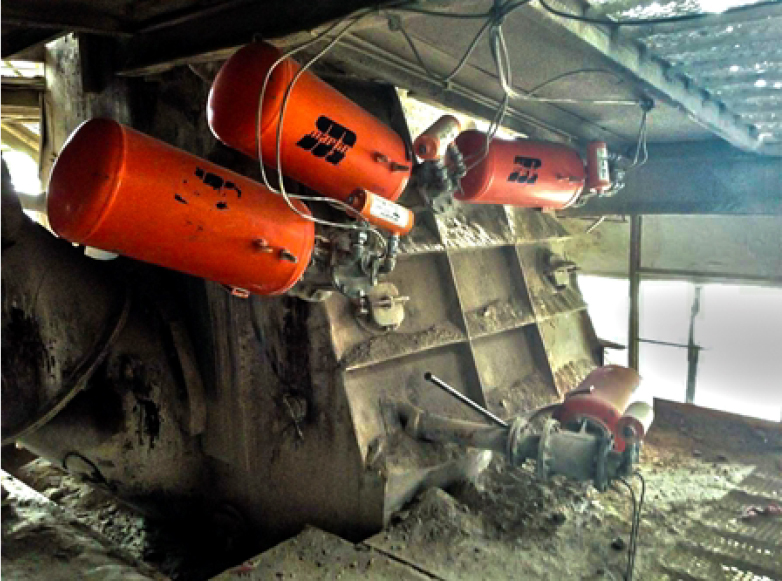 The frequency of the production stoppages were proving to be too costly - with high labor expenses, shortened refractory life and reduced hopper efficiency. Ash accumulation issues had been forcing Alaskan Brewery Company to shut down its equipment to cool and manually clean the swirlers and collectors of its ash handler on a weekly basis. The process required an outage of 3-4 days, including as much as twelve hours of maintenance time with bottle brushes and bead blasting. At the largest cement producer in Texas, when iron ore would come in wet, or it would rain, the ore got very sticky and would stick to the inside of the silo. TXI would shut down for regular 24 hour periods so they could manually air lance the resulting blockage that was causing low feed rates. Working with Martin Engineering, they developed a plan to install a series of air cannons. 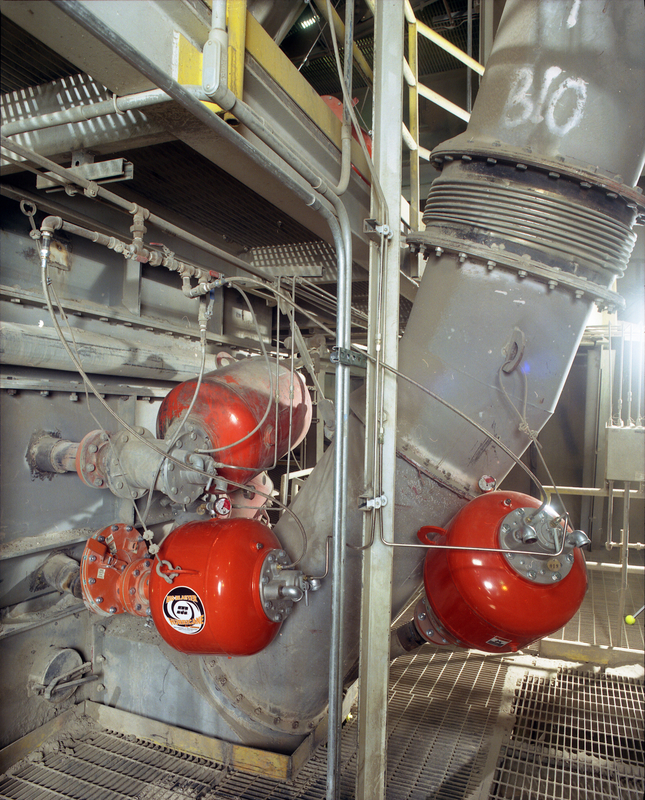 A large cement plant in Texas producing 900,000 tons of cement per year realized they had a problem with the air cannons on the feed shelf leading to the clinker. There was no access to the air cannons and they were in need of constant repair. To reach them, employees had to place scaffolding around the clinker. A plant produces over a million tons of cement every year. Due to the large production volumes, material was building up on the raw feed material inlet chute to the feedshelf in the preheat tower. The plant was incurring unscheduled outages due to buildup and blockages, costing tens of thousands of dollars per year. A coal-fired power plant handles 5,000 tons of fly ash per month. The buildup of ash was causing velocity increases of the flue gas through both inlet ducts to the precipitator. This was causing opacity spikes in emission, increasing the risk that the plant would face large regulatory fines from the EPA. A steel plant was having trouble with iron ore sticking to the walls of the hopper. The wet and slightly sticky material would accumulate in the hopper creating a blockage. Production couldn’t run smoothly and the plant had to hire people to continuously knock material off the wall of hopper to keep the flow of material running smoothly. A power plant was having trouble with coal conditions. The material was wet and slightly sticky, which made it stick to the walls of the hopper, so much so that the material would accumulate and create a blockage in the hopper. Production couldn’t run smoothly, requiring temporary shutdowns so employees could manually knock down the material from the walls of the hopper. One of the largest specialty paper manufacturers in North America, handling 300 tons of wet bark per hour, began experiencing a plugged chute. This blockage not only decreased productivity, but also created safety concerns. Manually unplugging the chute took an estimated two hours per day, adding to maintenance expenses as well as putting workers in danger. A mine was experiencing build up on the kiln walls, requiring continuous manual cleanup. This presented potential safety hazards for workers and increased man hours and overall expenses. 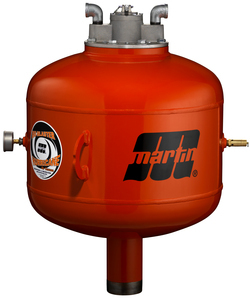 Martin Engineering recommended installing Martin® 150-Liter Hurricane Air Cannons with retractable nozzles as well as Martin® Thermo Safety Shield. A coal-fired power plant handles over a million tons of coal every year. The SCR catalyst screens had major build-up on them, decreasing productivity and efficiency. The existing sonic horns were not working properly and not improving the flow of material. The plant handles ash and was experiencing material buildup on the sides of the hoppers. This created a safety concern for those employees who had to perform manual cleanup. Employee safety is important to management so they reached out to Martin Engineering to help eliminate buildup and the need for manual clean out. The plant has had a problem with blockage in the coal silo since it started operation and has manually solved the problem by hammering the silo walls. 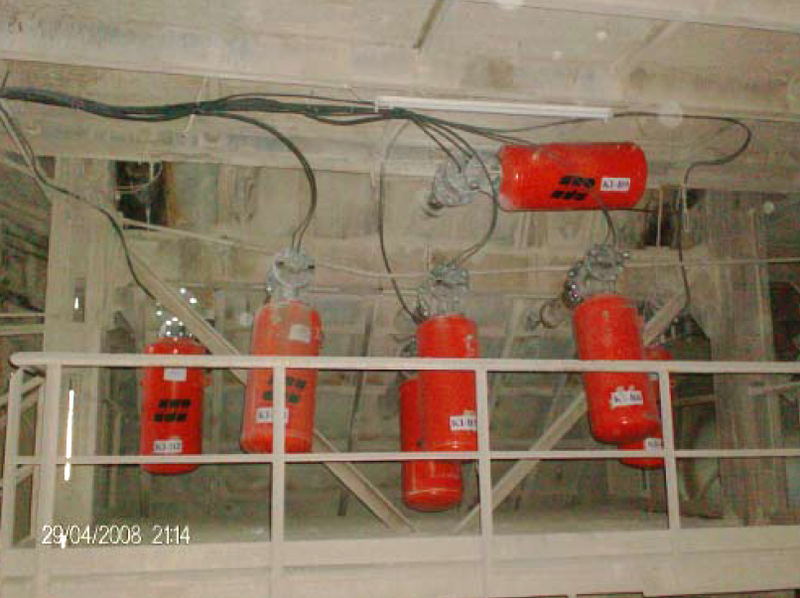 In some cases the blockage was very serious and completely stopped the flow of material inside the silo discharge. The plant has been running at reduced efficiency and has had to stop production to remove the blockage manually. Following the machining of various items such as taps and other parts, the swarf produced is stored in a number of silos. Once these silos are full, the swarf is unloaded onto trucks. The problem occurred when this swarf, being mixed with cutting fluid, could not be dislodged from the silo making it nearly impossible to unload. An existing lime kiln had been upgraded in 2014 with the addition of a pre-heater element to allow the plant to burn waste-derived fuels to save on energy costs. The introduction of the pre-heater section with its push rod type design started to create build up issues. Production was now critical with many kiln stops for manual cleaning and rodding. 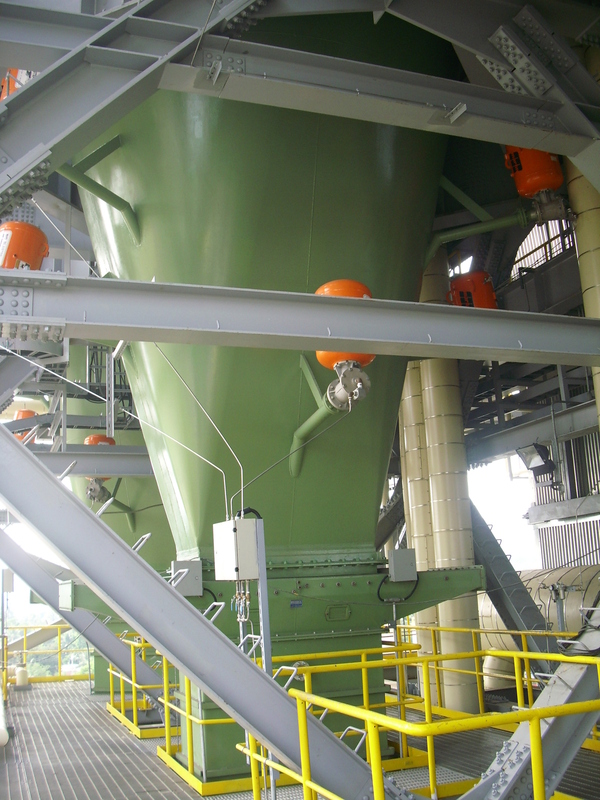 A cement plant in Turkey produced 9,500 tons of clinker per day. The rotary kiln entrance ramp area at the bottom of the preheater tower developed material flow problems because of the vertical angle of movement at the transition point and the horizontal angle of movement of the material. 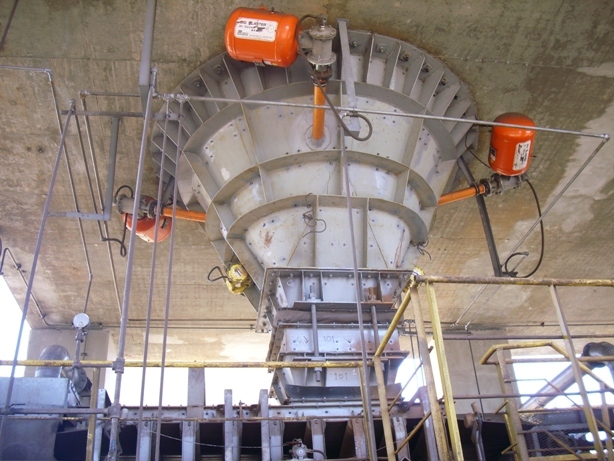 An aggregate plant needed a cleaning solution for its internal conveyors. Having already used the services and products from Martin Engineering in the past on other sites, they turned to Martin for help with this project. The solution recommended by Martin was to add Martin® QC1™ Cleaner HD with a Martin® Twist™ Tensioner. 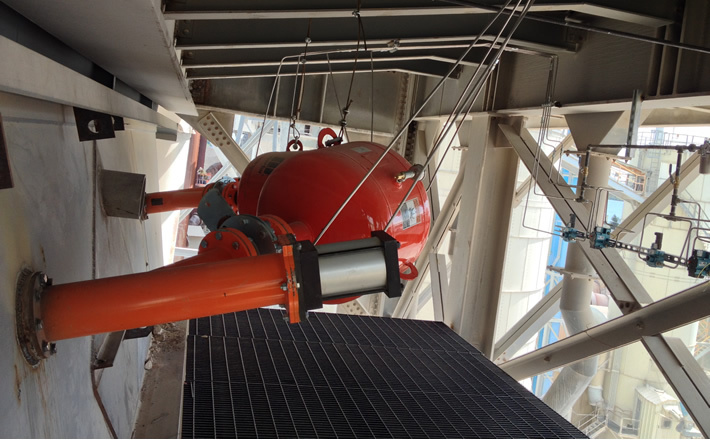 On the ship unloading conveyors at Arcelor Mittal in France, matter was accumulating along the belt and at the transfer points, which was reducing material flow. The client had to increase the number of stops to manually clean-up the material, generating fairly substantial additional costs. At the Arkema Group chemical site in France, a salt storage facility that stores and supplies salt had developed a lot of buildup from carryback along the belt. This buildup required a stop every six months for manual clean-up. After reviewing the system, Martin Engineering recommended two solutions. 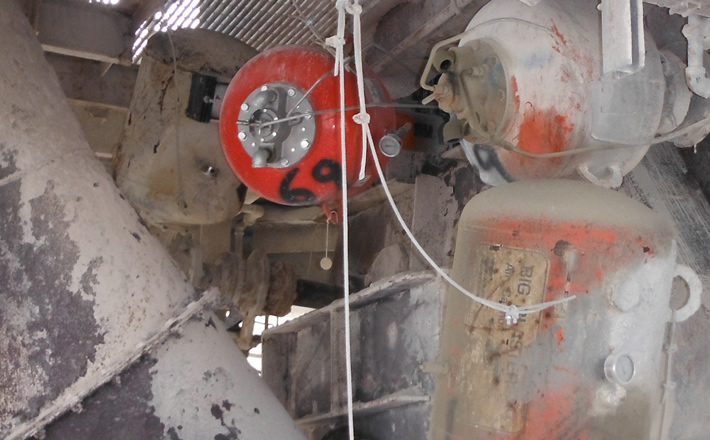 Workers at a cement plant were experiencing some difficulties achieving their volume needed due to the preheater's spoon. The issue developed because the number of air cannons needed to keep the material flowing was limiting the physical space. The plant realized they needed to find a solution that would promote material flow while optimizing space. 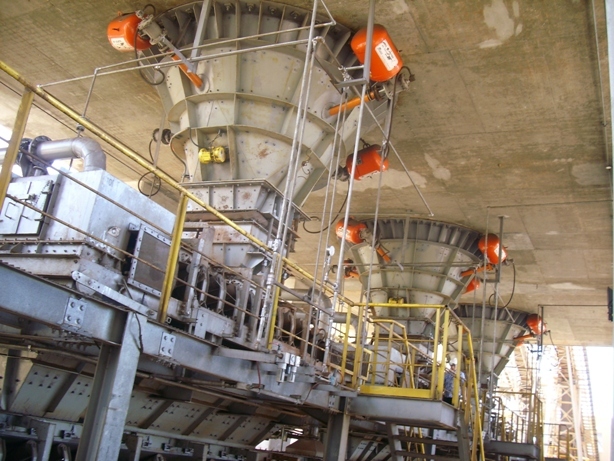 The Hunter Cement Plant facility in New Braunfels, Texas was experiencing transfer chute clogging and conveyor belt backups from wet fines and aggregate on its partially-covered D-07 conveyor. Heavy seasonal rain caused serious spillage issues and accumulation in the chute, which halted plant production. 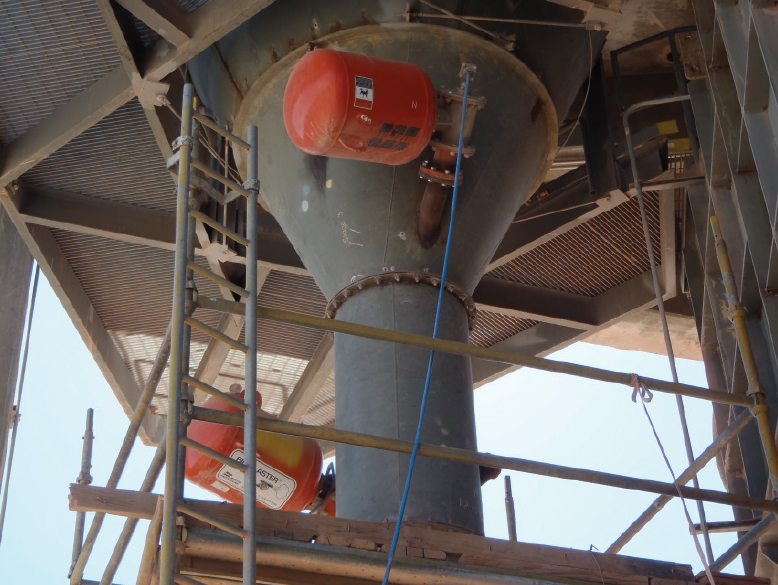 Aggregate Industries was experiencing clogging sand in its dual-spout pyramid hopper. Vibrators were used to loosen material, but vibrating metal walls turned the hopper into a giant horn, which caused a loud, unpleasant sound throughout the work area. No Risk. No Hassle. If, for any reason, you’re not completely satisfied with your product or solution, we will happily honor our Absolutely No Excuses Guarantee and fully refund your money or provide a better solution for you. Period. 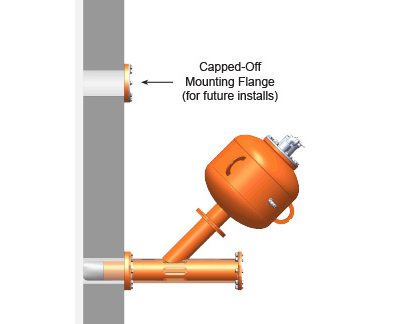 If you know you’ll need to install air cannon nozzles down the road, take advantage of scheduled downtime by installing new flanges. Once they’re installed, they can easily be sealed until you’re ready to upgrade to new equipment. 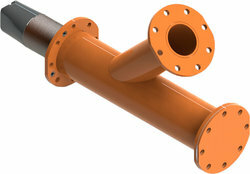 Plus, we’ll provide the flanges and installation kit at no cost! Our technicians have solved problems for people in your industry all over the world. Take advantage of our wealth of knowledge. 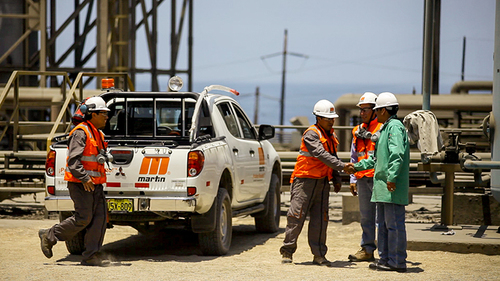 Tell us about your situation today to learn how Martin can improve your performance, safety and bottom line - with no obligation. We want to ensure that you choose the right solution for your exact needs and we are willing to invest the time upfront to get it right the first time. Looking for in-depth information on air cannons? Our brochure includes powerful solutions for putting material in motion. We are so confident we can solve your problem, we're happy to prove it to you first! 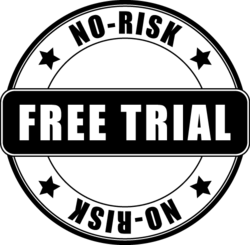 Ask us about a no-obligation free trial. Join our mailing list for periodic updates on company and industry news, product innovations and tips to enhance your material handling operation.